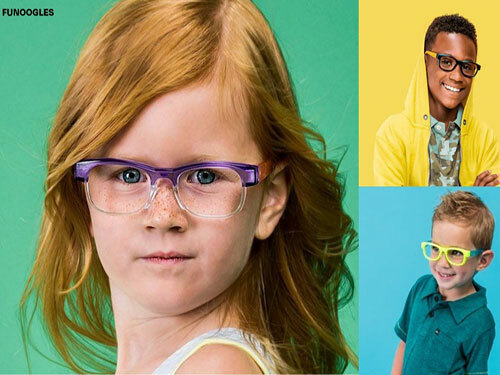 Give the kids a reason to get excited about their eyewear with Funoogles! These specs are stylish, fun and virtually indestructible. Plus, they allow kids to customize their look with interchangeable colors, frames and more! It starts with a base frame, then you can pick two different temple colors. Next, coordinate a full-frame clip that thickens the base frame and changes the color. For a little more color, add the brow clip on the top half of your Funoogles for a fun two-tone look. Finally, there's the outline clip that is thinner and can add a little color to your frame without being overpowering. The clips and temples come in a wide range of colors and designs to match the colors of their school or favorite sports team. The Funoogles starter pack comes with one clear base and a set of clear temples, plus one full-frame clip, one brow clip, one outline clip and one set of temples in your choice of colors. Starter packs begin at $120 (excluding lenses). It’s like getting multiple pairs of glasses for one price! You can add additional pieces starting at $20 each. Make an appointment for your kids today and send them back to school in style!